As we can see in the reprinted graphic above, two arrows pointed downward. The white chalked arrow indicates the act of Creating. The meaning of the dark-dashed arrow will become relevant soon enough. 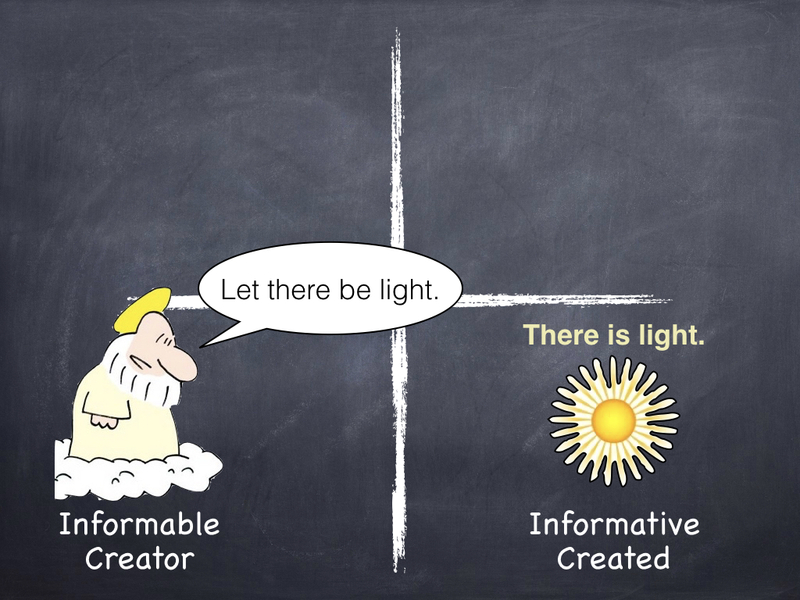 Some while after Creation’s labels were established, new words appeared in the lower quadrants. 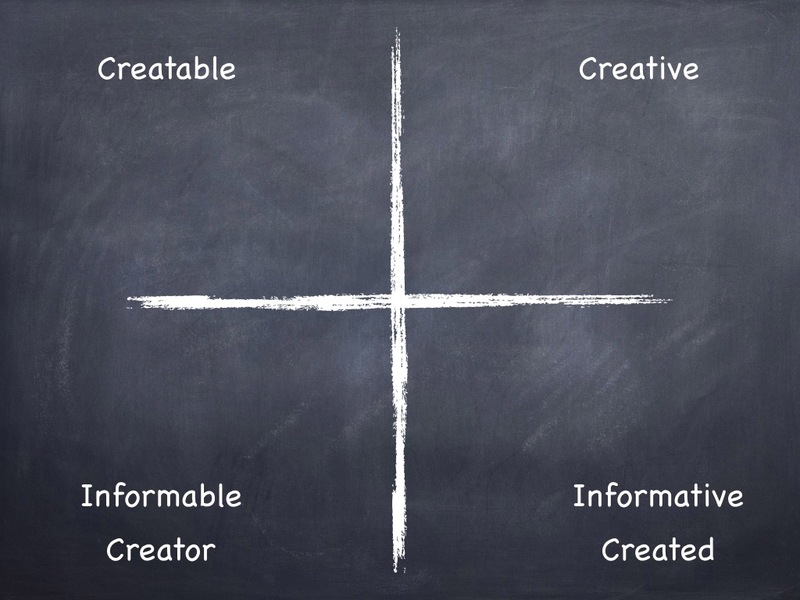 The term Informable joined the Creator already in the left quadrant. On the right, Informative shared the quadrant with the Created. These new labels make sense. The relationship between the words is inherent, emphasizing that anything Created/Observed is Informative; and anyone who can Perceive/Observe/Measure is Informable. Science expects an effect to have a cause. Quadernity leads us to suspect that every Created thing has an Informable receptor awaiting Informative signals. God says, Let there be light. The Created light nicely fulfills the Creator’s expectation. And there is light. God sees the light, that it is good. One morning’s chalkboard vision spelled out ‘Informing‘ on a white chalked arrow rising diagonally from the lower left quadrant (LLQ) toward the upper right quadrant (URQ). Compare the arrow for Informing, pointing upward, to the white chalk arrow for Creating, pointing downward. The insight that Creating and Informing are inverse actions is not naturally intuited. By coining a new word, we make this fact blatently obvious. The opposite of INforming is OUTforming! INformation and OUTformation are coupled processes, forever dynamically engaged. The word-play and linguistics of Quadernity facilitate understanding of its thesis. So that new words quickly become useful for you, Essential Vocabulary offers expanded meanings. Check out Vocabulary: Feedback of INformation and OUTformation. 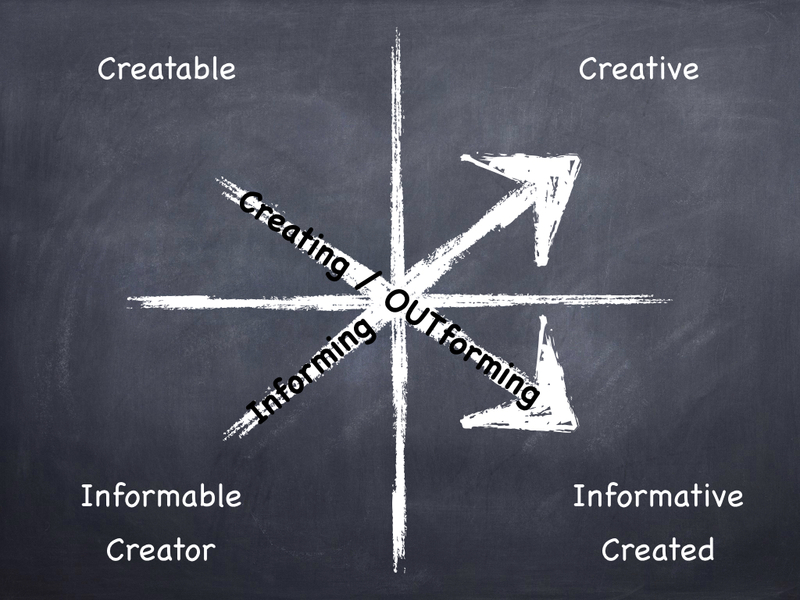 The act of Creating/OUTforming mediates between the four-quadrant functionaries of Creation/OUTformation. Following the parallel, but inverse, structure, we expect the act of Informing to mediate the entire process of *INformation. *We are using the noun ‘INformation’ to identify a process. This is not to be confused with the word’s more common usage, which denotes bits of data, as it is used in the following quote. Obtaining information is the very essence of observation. This outcome of ‘observing‘ is more obvious than Siegfried’s previous assertion (see previous chapter), which claimed that observing an electron or photon is the act that causes a probability wave to forfeit super-position and to assume particular properties. According to Siegfried, the act of Observing both OUTforms and INforms! Both INformed consciousness (URQ) and OUTformed corporeality (LRQ) are outcomes of the act of Observing. God sees the light, that it is good. Beyond visual perception, Observing is a word that can be used synonymously with measuring, encountering, interfering and entangling. It remains a mystery, even with today’s state-of-the-art technology in quantum physics, how an Observation/measurement/encounter produces the collapse of super-position into a singular position. And, in consciousness studies, how an Observation/measurement/encounter with stimulus can evoke qualia continues to be an unsolved ‘hard problem‘. The aside Measurement Problems explains how these “problems” are tackled by Quadernity. With the new labels in place, it was obvious there were two remaining labels to figure out, and quick work was made of that. It is through the act Creating/OUTforming that the LRQ is Created/OUTformed. Keeping to the symmetry, it is through the act of INforming that the URQ is INformed. ‘Informed’ becomes the label for the upper right quadrant. As was the case in the Quadrants of Creation, the final quadrant to be named is the ULQ. The upper left quadrant is the most mysterious! The label ‘Creator’ (LLQ) was legitimately assigned only after something had been Created (LRQ). 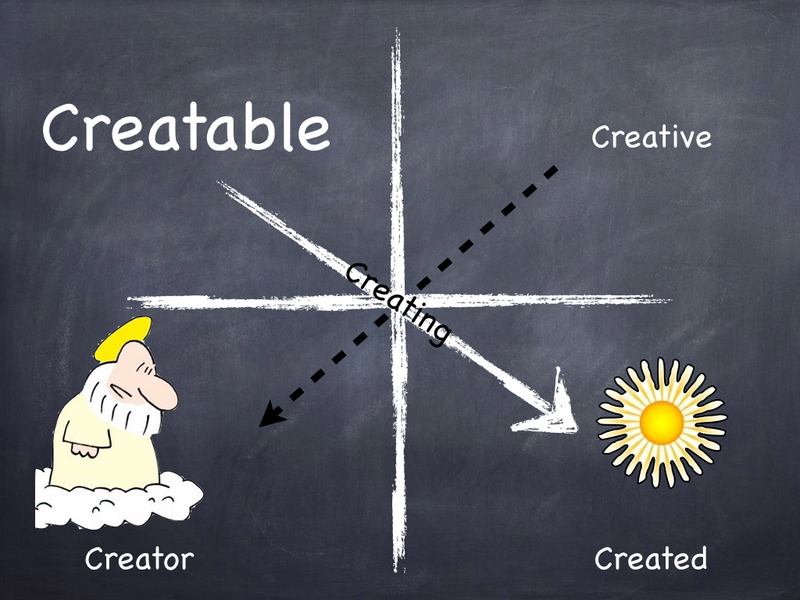 Using the obvious parallel structure, we can determine that the ULQ’s missing suffix should reflect the doer, as in the ‘or’ of Creator. Only after someone or something has become Informed, can the ‘Informer‘ be recognized. 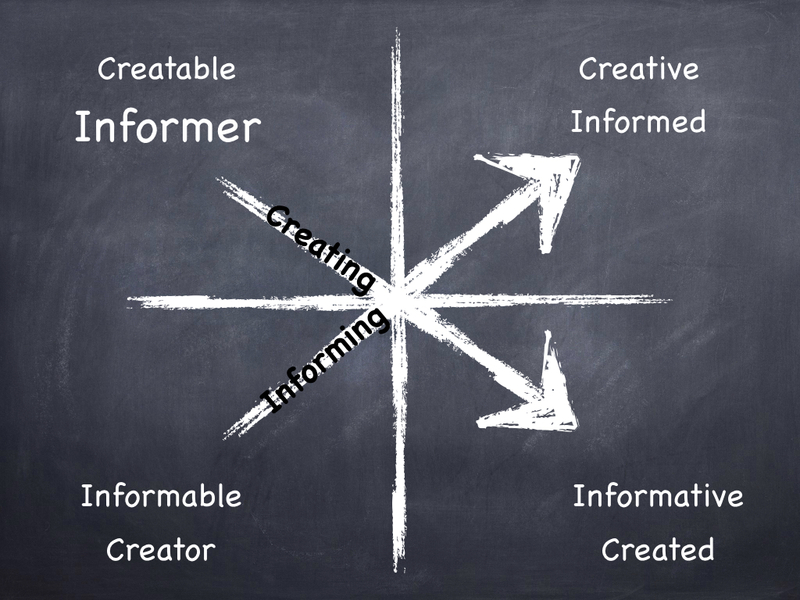 The labels, ‘Informer’ and ‘Informed’, thus placed in the ULQ and URQ, respectively, indicate that the Informed is also Creative, and the Informer is Creatable. A pattern of suffixes has unfolded. The __-ables (Informable and Creatable) were both Subjects in the left column, indicating the potential abilities of the actively causal agents of Observation, the Creator and the Informer, respectively. The __-ives (Informative and Creative) were both Objects in the right column, indicating the potential effectiveness of passive products of Observation, the Created and the Informed, respectively. For a short refresher on Subjects and Objects, which were introduced in the Quadrants of Creation through the SVO sequence (Subject-Verb-Object), visit Vocabulary: Subjectivity and Objectivity. The INformable and Creatable, as causal agents, are active Subjects. The Informed and Created, as effects of a Subject’s action, are passive Objects. Contrary to what the diagonal arrows could suggest, the Creatable Informer (LLQ) does not become the Informative Created (URQ). Subjects act to produce Objects/effects; however, they do not become the Objects at the effect of their actions. For example, a mother does not become her baby; she produces a baby within herself, by her internal actions and from her material resources. 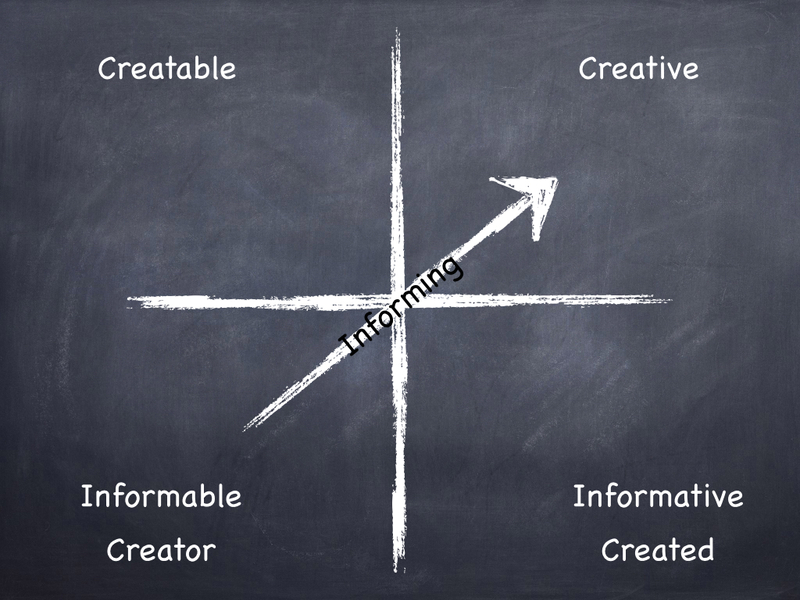 Perhaps less evident is the fact that the Informable Creator Subject (LLQ) does not become the Creative Informed Object (URQ). This is because we relate to being curious/Informable when we ask a question, and afterwards feel we have become Informed when our question is answered. We recall from INformed Consciousness an Object-pattern but we do not become that Object-pattern. We recollect from Consciousness, by attunement, patterns that previously INformed it. Collective Consciousness is the Informed. When we Observe/encounter something that has mattered to/for us, our reactions produce patterns that radiate energy outward into the space beyond our bodies. These emanating patterns INform the Collective Consciousness, otherwise known as the noosphere, the collective unconscious, or the Akashic Records. Spanning the universe, from the subatomic to the cosmic scales, Collective Consciousness transcends all who make the patterns by which it is Informed. Consciousness is holographic, meaning that any of its patterns are accessible from anywhere, at any time, by anyone. See article on Remote Viewing. Our vibrational patterns bring to our receptive mind the experiential feelings we had when we first emanated the pattern. Just like tuning a radio makes it pick up omnipresent, invisible signals and convert them into audible programming, our own energetic attunement determines which INformative patterns we spontaneously receive. We are INformed by these subconsciously selected patterns of energy and believe them to be our own private thoughts and memories. See Holographic Associative Memory. How often do we claim to have had a “hunch” about something or someone, but only in retrospect? Why are our hunches so often disregarded in the moment? Though we may fleetingly attune ourselves to energy patterns in our vicinity, such pre-ceptual patterns are taken as “white noise” by our subconscious mind and filtered out before they can reach the level of conscious per-ception. It is easier to remember our own memories because they are associated with a range of energy frequencies within which our personal energy fluctuations persist. On the contrary, we rarely remember the memories generated by others because we do not persist in alternate energy frequencies long enough to consciously access the memories associated within them. Twins and closely bonded relatives; although, even in these cases, the energy patterns perceived are usually exceedingly significant, as in times of trauma or death. When someone else thinks of us with strong feelings, perhaps preparing to call us on the phone, their energy field has a bearing on our own, and we will feel this energetic shift. We might even recognize its source. When the phone actually rings, we may know already who it is on the other end. We find ourselves turning to look in the exact location of a person who is staring at us from a distance. Knowing instinctively the direction from which our energy field has been impinged is an ability that can either protect us against a potential enemy, or increase our potential to mate or establish a friendship, depending on the intentions of the one who has stared at us. Ultimately our personal power is tied to how effectively we can attract essential data that enables our creativity and supports harmonious coexistence with others and within our environment. Our next chapter, Divine Divisions, elucidates additional symmetries which will take us another step toward mastering our Subjective minds and appreciating our Objective bodies.